Join us on an unexpected adventure This upcoming Summer! Registration is Now open! Please scroll down to see our camp details. Two lonely pirates, Ahab the Great and Sonny the Short, embark on a journey to prove their worth to their Pirate Clan the Tostitoses. Unfortunately their mission seems to be impossible as they encounter a dangerous storm and crash their ship on a mysterious island. Now they are shipwrecked and they must figure out how to fix their ship to continue their mission but something amazing happens…they stumble upon a treasure map and find a special adventure in the midst of their hardship. Our special islanders that join them will learn about what to do in hard times and how to find God in the midst of being shipwrecked. 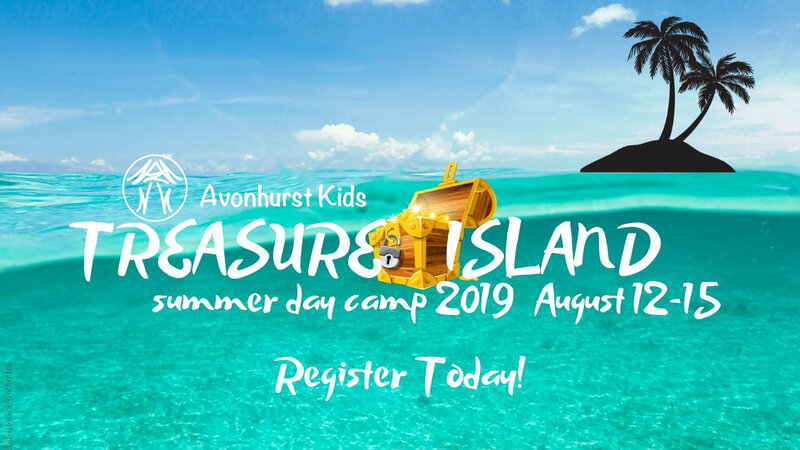 We will play group games, stretch our creativity with take home crafts, and experience the different wonders of this mysterious island together. Here is our Schedule for a Fun-Filled week! What Ages does our Camp Run? We run ages 5-11 (K-Gr.5). We split off our two groups into age appropriate groups. These groups will be split ages 5-8 (Group A) and ages 9-11 (Group B). They will do the activities opposite of each other to make everything age appropriate. The cost for each child is $25. Kids will work on two individual, take home crafts throughout the week. One of the crafts is an awesome camp t-shirt that they will tie-dye. The other craft is to be announced when registration opens. Kids will experience fun, messy and hilarious science experiments. This will teach kids about how God made the world and how amazing our world is. These experiments are highly interactive and will fit into what the teaching is for that day. We love to end our camp day as a large group enjoying high energy worship songs (with actions) and an interactive teaching from the Bible. The themes for each day will be announced when registration opens. They will be based around finding God in the hard times of our lives. Our favourite Pirates will also join us each evening in a interactive skit.